Gyuto Monks: Ancient Practice, Modern Sound Thanks to a new recording by former Grateful Dead drummer Mickey Hart, anyone can hear a sound that was cloistered in Himalayan monasteries for centuries. Music of Tibet is available for purchase from GemsTone-AV. It was 3 o'clock one morning in 1964, on the eve of the highest holiday in the Tibetan calendar, when renowned religion scholar Huston Smith awoke in a monastery in the Himalayas to experience something transcendent. "There fell upon my ear the holiest sound I have ever heard," says Smith, who was raised in China by missionaries and wrote the classic textbook, The World's Religions. Smith was so moved by the sound that he decided to record it, eventually bringing it back to the Massachusetts Institute of Technology. There, he played it for a colleague, an ethnomusicologist, who was similarly flabbergasted. "Why, the man just paced the floor in excitement," recalls Smith. "And at one point, he clapped his palm to his forehead, and he said, 'My God, I am hearing nine overtones!' "
An overtone is akin to a harmonic, so hearing nine of them is kind of like hearing a nine-part harmony in a single voice. Most people can't hear that many, and even fewer can sing as many. "[It's] a vocal miracle," says Mickey Hart, one of the former drummers of the Grateful Dead. He caught wind of Smith's tape in San Francisco in the late 1960s, and it excited him immediately. He couldn't wait to share it with his bandmates. "I mean, wait'll Garcia hears this, he's not gonna believe it!" Hart pips. "My ear was filled with monks for many years." Yet the sounds that thrilled Smith and Hart's ears were not, technically, consummate. Smith's 1967 tape is limited by several factors, primarily by the technology of the day, but also with the number of voices. Smith only heard the remnants of the choir — the few monks that survived the perilous trek into India after the Chinese invaded in 1959 and killed or imprisoned most of them. In the original Gyuto monastery, there were over a hundred monks in the choir. "No one's really heard a hundred monks outside of Lhasa for many years," Hart notes. People have heard smaller groups. Seven monks from the only other monastery that practices the chants won a Grammy recently. So, to re-create the sound of a full choir for this CD, Mickey Hart recorded each monk multiple times to make 10 voices sound like a hundred. "We overdubbed, and now there's over a hundred-voice choir here, which has never really been sounded in the West," says Hart. One of the first Tibetan monks to make his name in the West as a musician was Nawang Khechog, who was nominated for a Grammy in 2001. He says these chants are among the most secret and sacred of Tibetan Buddhism — that's why they're so heavily layered and deliberately hard to understand. "Very secret practice," Khechog says. "Secret as well as sacred ... So, therefore, to hide the words, in the general public, it's disguised in that kind of multitonic sound." 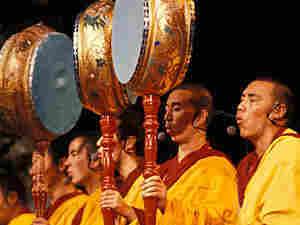 The Dalai Lama has approved these public performances as the chants signify things which, in his words, the ordinary eye can't perceive anyway. And it's important for the monks to go public — one of the ways the community has been able to stay alive in exile is through the patronage of enamored foreigners, or even just quizzical ones. Khechog says that when he used to live in New York, he would get funny looks when he tried to harmonize with the subway trains. "I start the chant, and then suddenly the train's gone," Khechog says, "and I'm still chanting that, and suddenly, few people standing there, and they think, 'What's going on,' you know?" But the curiosity of foreigners might be just what Tibetan exiles need. Proceeds from this CD go toward Tibet House, a New York-based foundation, and to build the Gyuto monastery-in-exile in India. And there's another benefit, says Smith. This music can help the rest of us understand our world more fully. "There is more in heaven and earth than there is in your philosophy," he quotes from Hamlet. "This enlarged my understanding of human beings and what they are capable of." Click the link above to hear Anil Mundra's full report.